I have had a lot of interest in the last few days about how I unmount my stamps. I have posted the link to the post on my blog where I showed pictures and went through how I do this process but since getting a few more inquiries I thought this post was worth revisiting. I did do a little editing to the original tutorial. Also, tonight is the deadline for the ProMarker giveaway! If you feel you didn't answer all the questions correctly that is okay, I said semi-correctly. For those who feel like I made you jump through hoops this time...oh well. I just thought it would be something different to do and since it was a bit of a bigger giveaway I did think it deserved a little more effort. I will never tell you that you have to post about my blog on a whole bunch of different places nor will I tell you that you have to follow my blog *okie is still in awe that people think they NEED blog followers since it kinda freaks okie out that 1,700+ are following her and is always concerned about making a wrong turn and getting everyone lost*. I got the static cling foam on eBay from a seller named 941nmb and I got the product quickly. The seller did combine shipping. I ordered 7 sheets and I now only have 1/2 sheet left. I believe the foam is about 1/8 of an inch thick, if that thick. 2. Here you can see where I stamped the images with Stazon ink. 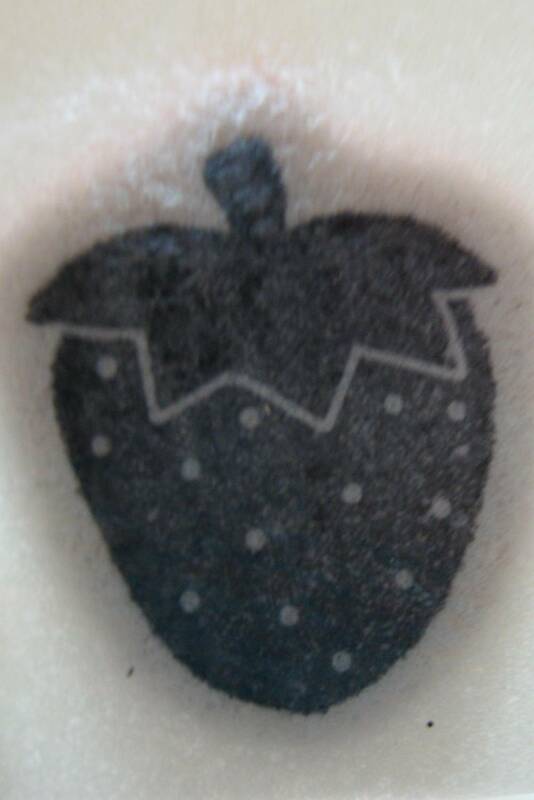 I used Stazon so it would be permanent and not rub off. I left the stamps on the foam as I was stamping so I could get them positioned where they were originally. 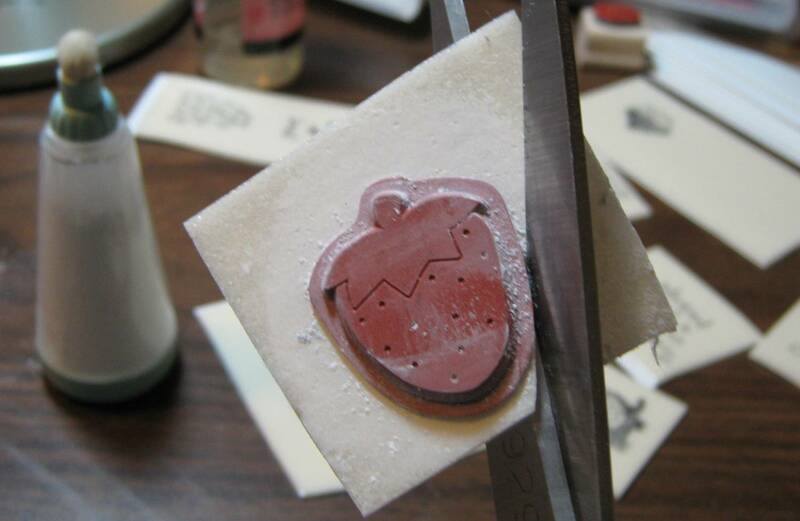 I did sometimes have to move a stamp or two so I could get an image stamped. 3. 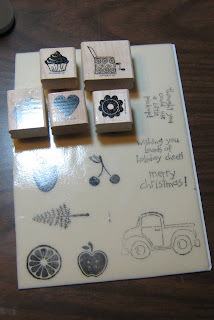 I unmounted my stamps by peeling them off the blocks and foam. Usually the foam stayed on the block and I was just able to peel the stamp off the foam. If you have problems you can stick the stamp in the microwave for a few seconds to loosen up the adhesive. Luckily I didn't have any problems and mine come off pretty easy. Some of the older ones took a little bit more elbow grease but it wasn't bad. 4. I lined up the image on the foam by holding it up to the light. I actually had the stamped side toward the light and the stamp facing me. I thought about trying to find my little light table thing I have but I was too lazy to go look for it. The good thing about the foam is that it takes a few hours for it to become permanent so if you don't get it straight the first time *okie thinks...or the first four times* don't worry, you can just pull the stamp up and reposition. 5. After trimming the foam on a few I noticed my scissors were getting sticky and I go the Undu out and cleaned them off. I decided to use the little device shown in the picture to get rid of the sticky and it made it a lot easier to trim the stamp. I can't remember the name of the thing, but it has talcum powder in it. 6. Next I trimmed right next to the stamped image. The foam cuts very easily. 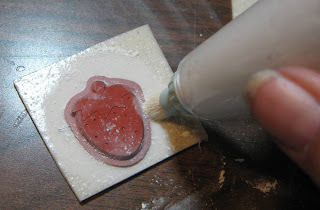 I was using big scissors at first but then went to using my Cutterbee's because I could get in the corners a lot easier on some of the stamps. 7. TADA! 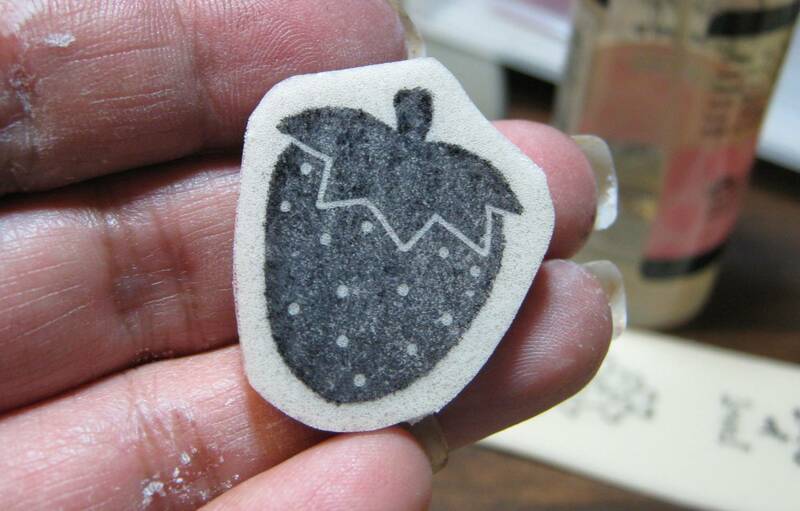 *okie throws her hands in the air like she just did the most fabulous magic trick* And this is what you end up with after you get the stamp stamped on the foam, unmounted from the block, positioned on the foam and then trimmed! A nice little stamp that takes up about 1/4 of the room you were using before! You may have to rinse or wipe off the stamp after you do this because the powder keeps the stamp from sticking to the DVD case. 8. Now you can see why I unmounted my stamps! What you see in the picture is actually space saving proof. 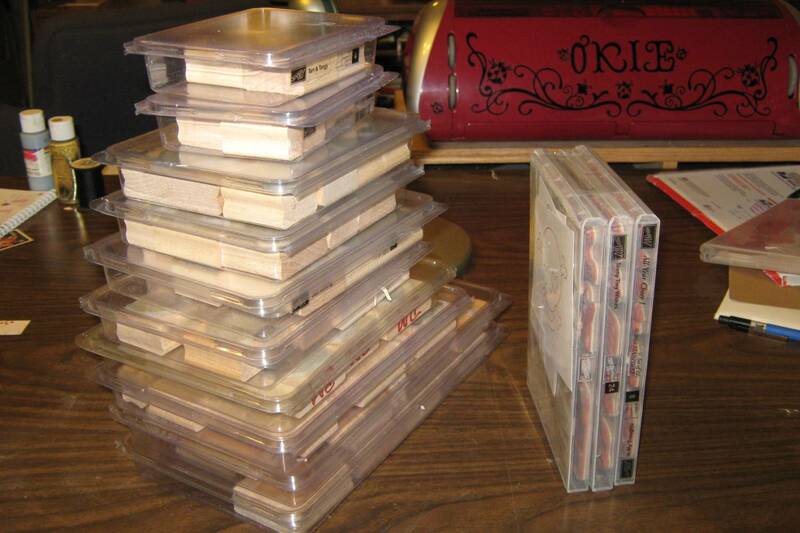 All 10 sets of the stamps fit in 3 DVD cases! A few of the sets were smaller ones but at least half were the large sets. 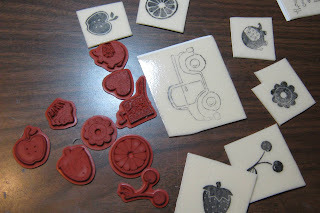 Stampin Up is offering many of their stamps in the "clear" form now that is how I order mine when possible. Those I leave on their original foam. If you do some rearranging of the stamps you can often get two sets in one case. I just line them up where I can fit more in, this way it saves on storage as well. 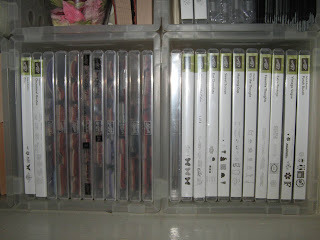 But I do not store on both sides of the DVD case if the stamps are on the original Stampin Up foam. If the stamps are a new wood mount set I take them off their original foam since it is thicker than what I use for the rest and it allows me to use both sides of the DVD case this way. 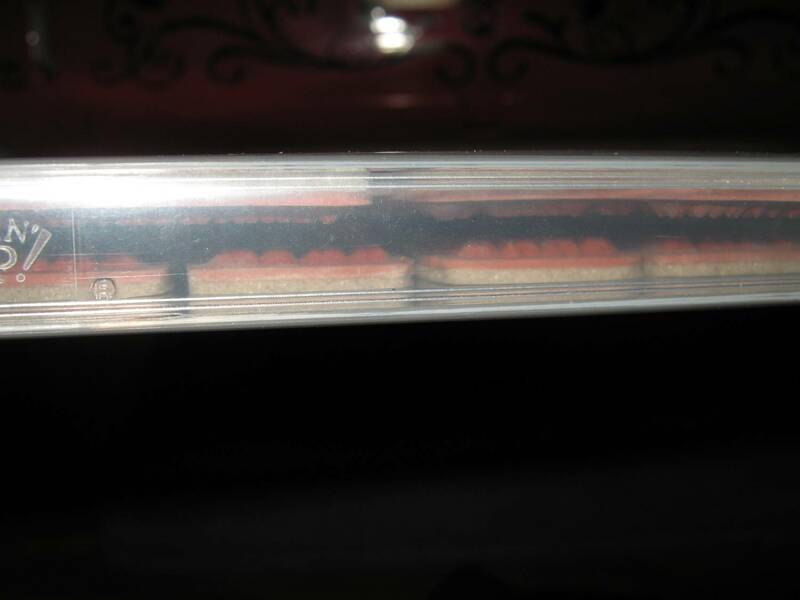 Here you can see how they stamps don't come in to contact with one another with the case closed. I have my sets on a shelf in my craftroom *okie thinks that was stupid to say because where else would she keep them? The bathroom? * I have the DVD crates from Walmart standing up and slide them in there. Stampin Up sells the DVD cases for $4.95 for a set of 4. If you are interested in ordering cases and don't have a Stampin Up demo just let me know and I will gladly refer you to a demo I do business with quite frequently. Grooaannnn...I really think I need to unmount all my wood mount stamps if I want to keep collecting them and not getting rid of any. You do help it seem do-able, though, so I might try it. Do you find you are forgetting to use your stamps now that you can't see the images as often? Do you have a notebook or something with all the images in it? I am such an "out of sight, out of mind" kind of person, I'm afraid I'd do all that work and then never stamp again! LOL! Thanks for revisiting your unmounting post. I've acquired a few more stamps since you posted last and am thinking I may do this before I get so many I don't want to. I have some in cd cases, some in drawers, etc., but I can see this system takes up a lot less space by unmounting them. 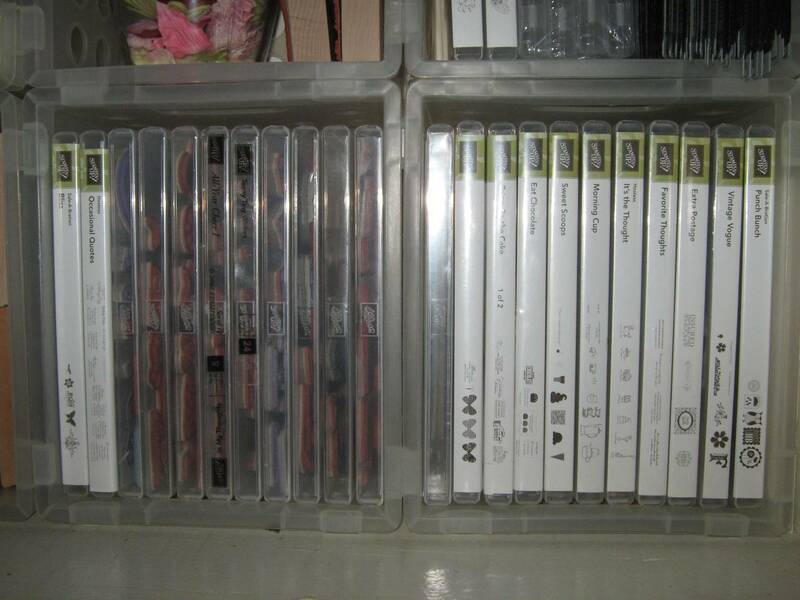 I'm thinkin the SU cases must hold more than the cd cases, which have been getting harder to come by. I say you can make up the rules for your giveaway and if some think it's jumping through hoops - If they want to play.....JUMP! 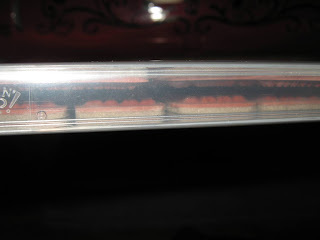 I'm new to your blog and wonder if you have discussed how you store your stamps? Do you have a master catalog that you refrence or just have them all stacked up? I'm starting to get more stamps and often times forget that I alreay have a stamp and like it so much I rebuy it (sure I'm the only one that has ever done that).....and thought if you could share how you keep your stamps all organized and in categories.....I (and maybe others) would like to hear how you do it. Thanks for the tutorial. Very helpful. My wood mounted stamps are all thrown in a small bin and whenever I need to find one it takes me forever. I'm going to have to do this really soon! This will help me tremendously!!! I have done the same thing but I didn't stamp the old ones because I was not sure how to get them to line us. The new one are easy to stamp then cut. I am using SU cases and I really like them. I don't like the hard plastic of the DVD cases for some reason. Thanks for sharing this post again. 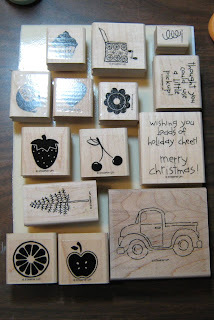 Funny but I was just sitting and looking at some of my wood mounted stamps this weekend and thinking I need to dewood these things. You always help me out so much Okie. Thanks for this again. I really need to unmount mine so I can find what I want. Besides it looks nice and neat in your room. I have tons of stamps to unmount. Thans for the tutorial. I'd like any info you have on the tool with the powder. Thanks for all the great posts.